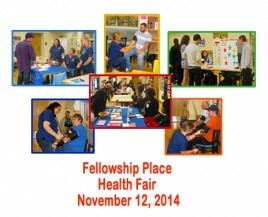 Over a dozen community agencies were present to share health & wellness information and conduct health screenings. Exhibiting agencies included Yale New Haven Hospital, Communicare, Stepping Stone Transitional Housing, Gateway Community College Nursing students, Liberty Community Services, Hill Health Center, and Community Action Agency Energy Assistance program. Information presented included women’s health, dental health, smoking cessation, transitional housing, HIV, STD and Birth Control information, information about heart disease, diabetes, and physical fitness, Meals on Wheels, and Energy Assistance. Diabetes screenings and blood pressure screenings were provided free of charge.